Make the most of your time at Target Field with our top tips for game day. There’s no better way to send a Minnesota summer day than with an outdoor baseball game at Target Field. Located in the Warehouse District of downtown Minneapolis, Target Field is one of the league’s best ballparks, named the top overall sports stadium and game experience in North America by ESPN The Magazine shortly after the field opened in 2010. But the entertainment isn’t limited to what’s on the field. There’s plenty happening outside the stadium, too. Tip: Check out Metro Transit for your game day transportation needs, and make the most of your experience by booking a hotel and making it a weekend in Minneapolis! There are three breweries just around the corner from Target Field. Inbound Brewing offers a cool minimalist vibe, alternating musical acts and 12 beers on rotation. 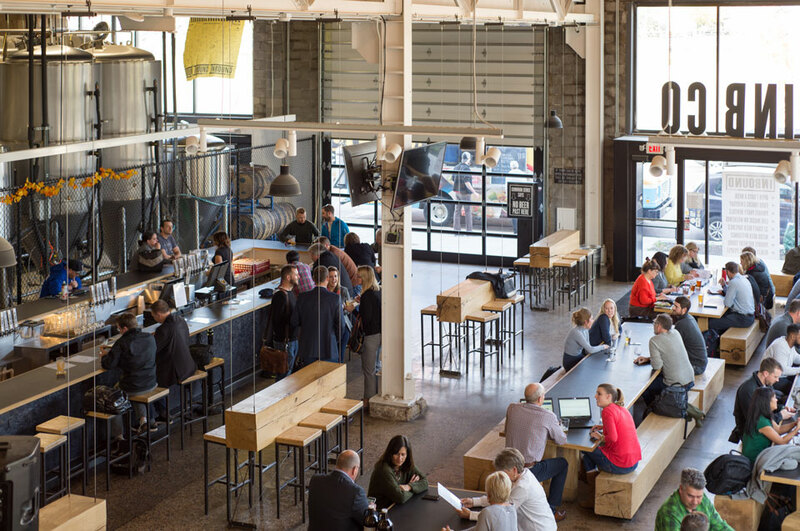 Fulton, Minneapolis’ first tap room built in 2009, is one of our most popular breweries and is served in over 100 local restaurants. Feeling adventurous? Modist Brewing serves up a Mexican Dark Chocolate Stout brewed with dark chocolate, vanilla bean, cinnamon and red chili smolder. All three breweries are within blocks of the stadium, have outdoor patios, rotating food trucks and, above all, delicious and innovative beers. Take a peek at our all-encompassing Minnesota Brewery Map. Just down the block from Target Field is Cowboy Jack’s, a saloon-style bar with an expansive rooftop patio that’s always packed with Twins fans enjoying a beer while listening to live music or playing yard games. Starting an hour before each game, Cowboy Jack’s offers a number of drink and app specials. And don’t miss the ticket giveaway before all home games. Our friends across the pond have the right idea when it comes to gathering with friends for food and drinks before or after a game. Experience that same atmosphere at one of the local pubs in town. Brit’s Pub & Eating Establishment is a British-inspired Minneapolis landmark that features a massive rooftop greenspace for lawn bowling. When it comes to food, the pub serves traditional British fare like scotch eggs, fish and chips, and burgers and mash. Or, make your way to Kieran’s Irish Pub where you can fuel up on Irish staples like corned beef Reuben sandwiches, fries slathered in gravy and traditional fish and chips. Grab a table on a rooftop overlooking Hennepin Avenue for some of the best people-watching. Seven Steak & Sushi is an upscale steakhouse that also serves killer sushi. Union Restaurant features the only year-round glass-enclosed and heated retractable rooftop in Minneapolis. Crave Restaurant has a see-and-be-seen vibe with an extensive wine list. For more ideas check out our favorite outdoor patios in town! Within walking distance from Target Field, Prohibition is located on the 27th floor of the historic Foshay building. It has an unabashed Great Gatsby vibe and a bird’s-eye view of Minneapolis. Make a night of it and stay at the W Minneapolis — The Foshay. On game days, there are tons of activities going on directly around the stadium. Get to the ballpark early and walk around the outside space called Target Plaza (especially if you’re bringing the kids). Here you’ll find multiple photo opportunities, including an oversize bronze glove, statutes of former Twins Hall of Famers and the Tradition Wall which recognizes every player who has ever worn a Twins jersey. While you’re hanging out on the plaza stop by the Majestic Twins Clubhouse, a merchandise shop where you can load up on Twins gear. You can also tour the stadium and see areas of Target Field that many baseball fans don’t get to see. Depending on the time of the game, tours are given at either 11 a.m. or 1 p.m., and tickets are available online or at the Target Field box office. On a beautiful day in Minneapolis you’re going to want to spend as much time outside as you can. Before or after the game, stop at the Walker Art Center’s Sculpture Garden. It’s free, completely outdoors and features iconic pieces you’ll want to snap a selfie in front of. If you’re looking to release some energy (hopefully after a Twin’s victory) walk or bike along the Mississippi riverfront to the Stone Arch Bridge where a great view of the Saint Anthony Falls awaits. Whether you want to grab a meal before the game or are ready for round two after all your cheering, there are plenty of local restaurants near Target Field. 112 Eatery is great late-night spot. It’s famous for its burger topped with brie, but you’ll also find a good mix of dishes inspired by places all over the world. Monte Carlo is a fantastic joint with a well-preserved 1950s interior and bar and an incredible outdoor patio. Order the chicken wings. You won’t regret it. If you are looking for comfort food, Cuzzy’s is only a few blocks from the stadium and has all the classics. Or there’s Gluek’s Restaurant and Bar, with its rich history, German-influenced menu and day-game specials. For brewpub fare, The Freehouse offers a stellar beer list and mouth-watering menu. For a kid-friendly atmosphere, The Loon Café or Pizza Lucé are close by and offer plenty of menu options that you and your kids can agree on. 9. Make It a Weekend! Too played out? Stay over and experience more tomorrow! Check out our hotel deals to make the most of your trip. And be sure to check out our North Metro hotels for a stunning natural environment or our West Metro hotels, which are just minutes from downtown! Hero image: Target Field. Photo by Brace Hemmelgarn, Minnesota Twins. Courtesy of Meet Minneapolis.